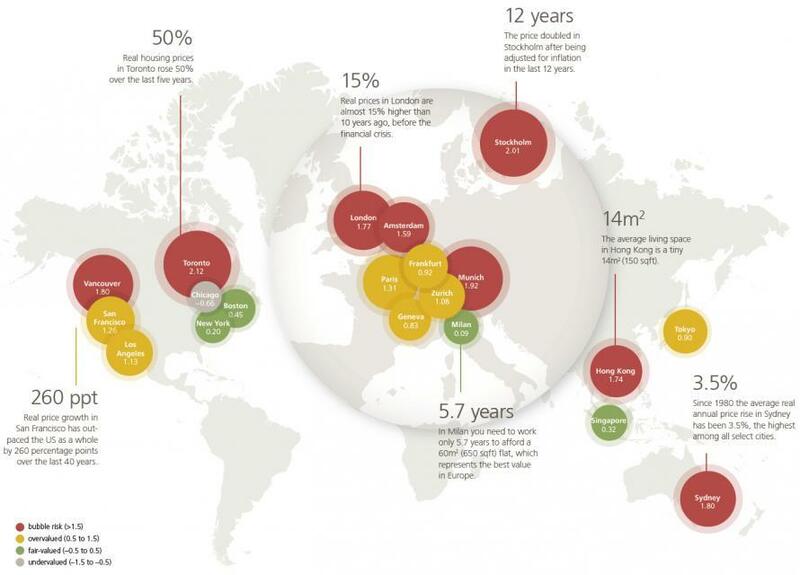 For much of the past year, we've been carefully monitoring developments in the high-end of the world's ritziest property markets - cities like New York, London and Hong Kong as well as tony suburbs like Greenwich, Conn. - for warning signs that America's torrid post-crisis real-estate rally could be nearly exhausted. 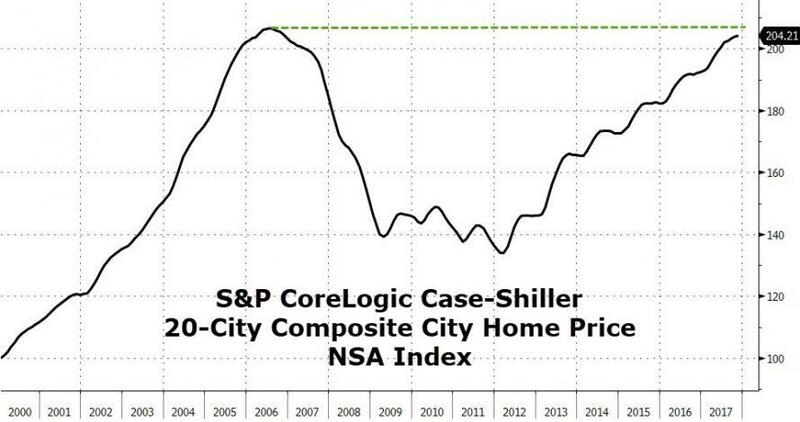 As US home prices have rocketed to within a hair's breadth (1%) of their highs from 2006, we've pondered the question of whether this is a "market top" or a "breakout." The high end, ultimately, could be the final piece of this puzzle. After all, conventional wisdom would have you believe that real-estate values in dynamic urban centers like NYC could never fall - at least not meaningfully. The perception, as we pointed out back in February, is that world-class cities will never go out of style, and their already high-densities deeply limits supply. But that logic leaves one crucial question unanswered: What happens when too many people pile into a supposedly "safe" asset? This is essentially the narrative that unfolded during the housing crisis, as millions of Americans assumed real-estate valuations could never retreat (beyond the occasional "gully"). But even the world's trendiest markets have their breaking points. "Even with New York real estate prices, you do hit a point in which resistance sets in," said Frederick Peters, CEO of brokerage Warburg Realty. "People are very anxious about overpaying." For what it's worth, analysts at UBS to Morgan Stanley have predicted that a correction is looming in the near future. We recently reported that, according to data collected by a private company, Manhattan apartment sales plunged to a six-year low in January. And now, Bloomberg is reporting that Manhattan home sales plunged the most since 2009 during the first quarter, according to a popular report compiled by Miller Samuel Inc. and Douglas Elliman Real Estate. The two firms tabulated that sales dropped 25% during the first quarter. Meanwhile, Corcoran Group, which compiles its own report, recorded an 11% decrease. The drop was observed more or less evenly across the market, from the ultra-high end (which has been struggling for months) to studios and one-bedrooms. The drop in sales spanned from the highest reaches of the luxury market to workaday studios and one-bedrooms. Buyers, who have noticed that home prices are no longer climbing as sharply as they have been, are realizing they can afford to be picky. Rising borrowing costs and new federal limits on tax deductions for mortgage interest and state and local levies also are making homeownership more expensive, giving shoppers even more reasons to push back on a listing’s price -- or walk away. While just a few years ago, bidding wars were the norm, "there’s nothing out there today that points to prices going up, and in many buyers’ minds, they point to being flat," said Pamela Liebman, chief executive officer of brokerage Corcoran Group. "They’re now aggressive in the opposite way: putting in very low offers and seeing what concessions they can get from the sellers." Any seller who wanted to close a deal during the first quarter had to lower their ask. Indeed, 52% of all sales closed during the period were for less than the most recent ask. In 38% of deals, buyers agreed to pay the asking price. But by then, it had already been dramatically reduced. Per Bloomberg, no deal is too small to preclude haggling. Peters said that these days, he gets dozens of emails a day announcing price reductions for listings. And buyers are haggling over all deals, no matter how small. In a recent sale of a two-bedroom home handled by his firm, a buyer who agreed to pay $1.5 million -- after the seller cut the asking price -- suddenly demanded an extra $100,000 discount before signing the contract. They agreed to meet halfway, Peters said. Buyers also are finding value in co-ops, which in Manhattan tend to be priced lower than condos. Resale co-ops were the only category to have an increase in sales in the quarter, rising 2 percent to 1,486 deals, according to Corcoran Group. Sales of previously owned condos, on the other hand, fell 12 percent as their owners clung to prices near their record highs, the brokerage said. The median price of all sales that closed in the quarter was $1.095 million, down 5.2 percent from a year earlier, brokerage Town Residential said in its own report. Three-bedroom apartments saw the biggest drop, with a decline of 7 percent to a median of $3.82 million, the firm said. Both new developments (of which there are many) and existing home sales have fallen. To be sure, if one insists on believing this is just the beginning of another gully, one could point to expectations that US GDP growth will be relatively subdued during the first quarter - as it often is. But even if we see a strong rebound in Q2, perhaps the most important factor that has been driving the high-end real-estate boom exists outside the US. Chinese buyers, who've helped fuel the speculative boom, are finding it increasingly difficult to move their wealth offshore as China has cracked down on capital flows and, specifically, foreign real-estate transactions involving wealthy Chinese.